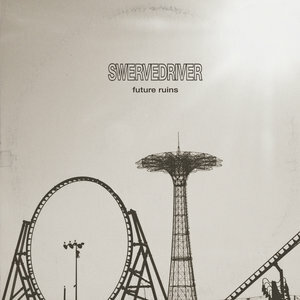 Swervedriver's sixth album Future Ruins, their second since reuniting, faces dystopia with sustained momentum. "We are ruled by fools / These are future ruins / That the king is insane / Is now old news." Swervedriver would like to welcome you to 2019; meet the new year, same as the old year. There is more to the title track of Future Ruins than a mood of angry resignation or resigned anger. There is also a considerable amount of open space for a band originally built around a full-throttle ethos; so there is more of less, then. A constant ghostly echo in the background of "Future Ruins" fills in the cinematic picture and drills the plot of the album home. It is a song to get lost in, about a world that's lost. Fear not: Swervedriver have never been a dour, downer band, and they aren't about to start being one now. As the reunion age of rock and roll keeps chugging along, one has to wonder if the bigger challenge facing so many revenants de rock is not the first triumphant tour or return-to-form record, but the ability to sustain such momentum. Swervedriver's journey back from inactivity has, contrary to their own name and past fixation with American car culture, overall been a patient one. Touring and limited new songwriting began over a decade ago, but I Wasn't Born to Lose You, their fifth studio LP, didn't arrive until early 2015. Like subsequent back-in-action albums from 1990s peers Ride and Slowdive, Swervedriver sounded ready to get on with the business of being themselves in the present. Core founders Adam Franklin (guitar and vocals) and Jimmy Hartridge (guitar), old school bassist Steve George, and relative newcomer drummer Mikey Jones keep the chemistry consistent from I Wasn't Born to Lose You to Future Ruins. They don't repeat themselves (though there wouldn't be much reason to complain if they did) and they don't backtrack or make any wild left turns. They do, as noted, make inroads into new uses of space, and take that approach as an opportunity to refine their instrumental interplay further. The way that Franklin's and Hartridge's guitars wind around each other in the opening "Mary Winter" makes a sung chorus redundant, as they recognized by leaving words out of it. The spoken-word "Everybody's Going Somewhere & No-One's Going Anywhere" and the swelling finale "Radio Silent" find their power in ambiance and drifting atmosphere. One thing that Swervedriver were particularly adept at back in the day was functioning as a kind of English-American rock and roll translator. They made sense of the Thames Valley dreams for US audiences by speaking in brawny riffs, and they refashioned the propulsion of late 1980s American alt-rock to fit British tastes as well. There is perhaps less of a need for that particular skill in today's everything-from-everywhere-all-the-time marketplace, but the balance of rock aggression and great melodies from "The Lonely Crowd Fades in the Air" to "Good Times Are So Hard to Follow" show Swervedriver still tuned into this sensibility.